A big brown trout is a wary adversary in its home waters. They know every rock and current seam in their section of the stream and fooling one can prove to be utterly frustrating. Their mood changes by the minute and can go from chasing other trout to delicately sipping tiny midges or mayflies within only a few minutes. But with stealth, patience, and time spent learning their habits, you can fool the wary resident brown and be a worthy contestant to the brown’s game. It is the challenge of catching brown trout in their home waters that keeps me going back. They provide the highest highs and the lowest lows. This entry was posted in Skull Art, Uncategorized and tagged adipose, art, brown, caudal, defy ordinary, dorsal, drawing, fish, fishing, fly, kype, laferriere, nick, painting, salmo, skeleton, skull, trout, trutta on December 8, 2014 by nicklaferriere. Dry fly fishing can be exciting but requires a lot of patience. Sometimes everything works out and you get a fish to rise to your fly. This however is the moment of truth. Whether you’re going to fool the fish or you’ll get a harsh refusal. 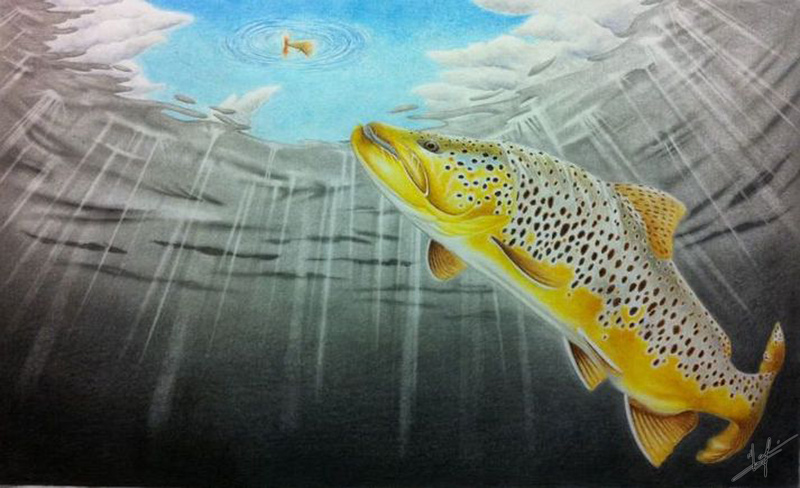 This entry was posted in Fine Art and tagged art, artwork, brown, drawing, dry, fishing, fly, nick laferriere, painting, salmo, trout, trutta on May 3, 2013 by nicklaferriere. One of the reasons why brown trout are one of my favorite fish to chase besides the challenge is the diversity of the species. Red spots, black spots, no spots, heavily spotted, each fish is unique and no two browns are the same. Each fish has spotting, colouring, and even body shape that is exclusive to that specific fish. Depending on where you fish also affects how they look. Different strains and genetics are found across the country. In some areas, fish will have a lot of spots, and in other water bodies, fish will be almost void of spots altogether. Even the type of water can affect how browns look. Tannic water vs clear water. 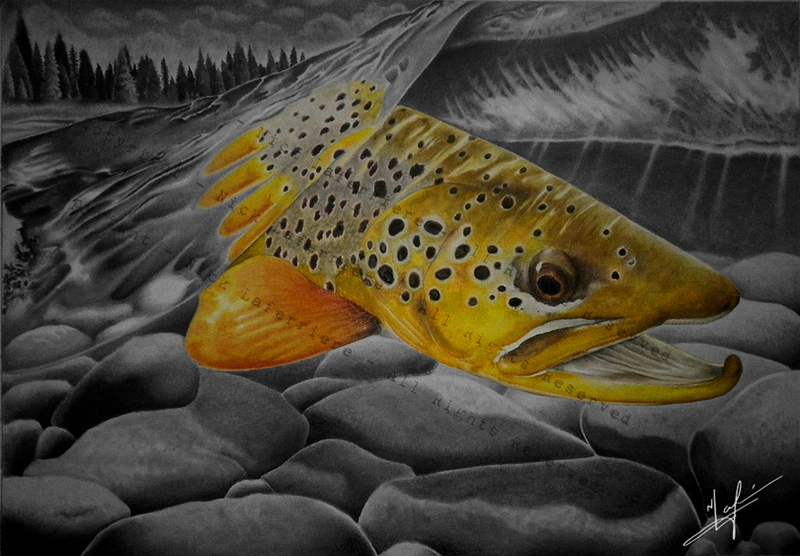 This drawing depicts a heavily spotted brown, a prize in any fly fisherman’s photo album. For any fly fisherman, a heavily spotted brown is the ultimate small stream reward. It’s amazing that a fish with such a mosaic of spotting and exaggerated colour could disappear in their home waters, and yet, they do all the time. This entry was posted in Uncategorized and tagged art, artwork, breac, brown, drawing, fish, fishing, fly, forel, forell, Forelle, laferriere, nick, nick laferriere, painting, pstruh, salmo, silungur, trout, trucha, truite, trutta on April 23, 2013 by nicklaferriere. A big brown trout is a wary adversary in its home waters. They know every rock and current seam in their section of the stream and fooling one can prove to be utterly frustrating. Their mood changes by the minute and can go from chasing other trout to delicately sipping tiny midges or mayflies within only a few minutes. But with stealth, patience, and time spent learning their habits, you can fool the wary resident brown and be a worthy contestant to the brown’s game. It is the challenge of catching brown trout in their home waters that keeps me going back. They provide the highest highs and the lowest lows. There’s just some days when no matter what you do, they always seem to have the upper hand. This piece depicts a resident brown moving in a freestone stream. Big browns will have a few favorite lies where they frequent. If you’re patient and observe carefully you can catch them cruising from one hide out to another. There are times when a brown trout can completely conceal themselves from the world in flooded timber or in an undercut bank. But if you’re lucky, you can catch one of these brutes cruising away from cover. Original Artwork owned by April Vokey. Thanks April. A cruising brown trout making quick work of cruising across a vulnerable shallow section to another one of its favorite hide outs. This entry was posted in Fine Art and tagged april vokey, art, artwork, brown, drawing, fishing, fly, hookjaw, kype, laferriere, nick, nick laferriere, painting, salmo, trout, trutta on April 23, 2013 by nicklaferriere.